3 simple steps to kill head lice and eliminate their eggs. For adults and children from 2 years. Step 1 Detection The only way to confirm a head lice infestation is by finding a live moving louse on the head. This can be done with the specially designed Full Marks Detector Comb. Weekly detection is recommended for ongoing prevention. Step 2 Treatment You should apply enough solution to cover the scalp and hair to ensure complete success. First, comb through dry hair with a normal comb to remove any tangles. Shake the bottle and apply the solution to dry hair by applying the solution close to the root. Ensure the entire scalp and hair are fully coated with the solution. Massage in and leave on the hair for 5 minutes. Remember, if someone in the household has head lice it is recommended that all members are checked as head lice are spread by close head to head contact. Treating everyone with head lice on the same day will minimise the chances of re-infestation. Step 3 Removal After 5 minutes comb through the hair using the fine metal toothed Full Marks Removal Comb provided to remove dead lice and any eggs. Tip: To ensure a thorough job, divide the hair into four quarters and comb each quarter separately. Take a small section of hair from the quarter; place the teeth of the comb as close as you can to the scalp and comb downwards away from the head to the tips of the hair. After each stroke, rinse the comb to remove any hair, lice and eggs and wipe it on a tissue. Once an area of hair is free of lice and eggs push it to one side and continue until the quarter is completely clear. Once you have finished the treatment, wash out the solution using an ordinary non-conditioning shampoo. Conditioner is not necessary. It may be necessary to wash the hair a couple of times to completely remove the solution. Effective in one use* *Repeat above steps on days 7 and 14 if necessary. Please read the enclosed instruction leaflet carefully. Each application requires approximately 50ml of solution to treat a head lice infection on one head. However, you should apply enough to cover scalp and hair from root to tip to ensure complete success. Long and/or thick hair may require more solution. Used according to the instructions, Full Marks Solution and removal comb will kill head lice and eliminate eggs. 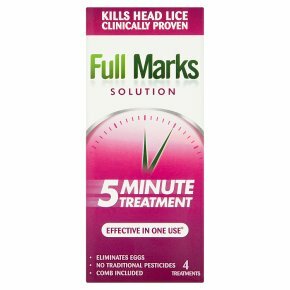 Unlike traditional head lice treatments which poison the lice, Full Marks Solution has a physical action on the lice causing them to dehydrate (lose water) and die. They can then be removed along with any eggs using the Full Marks Removal Comb supplied. Should a member of your family need treatment with Full Marks Solution, check other members of your family for live lice with the Full Marks Detector Comb and treat if necessary. Precautions:<br>If you experience sensitivity discontinue use, and please tell your doctor or pharmacist who will advise you on the necessary action to take. Avoid contact with eyes. If the head lice solution comes into contact with the skin (other than the scalp) or the eyes, it can be washed away with warm water.<br><br>This product is an oily liquid; care should be taken when applying the product, as it might make hard surfaces such as floors or baths slippery. You should protect clothing and upholstery with a towel as this product can stain fabrics.<br><br>Caution:<br>This treatment is not a water-based shampoo. Keep hair away from any naked flame or heat source, and do not smoke whilst using this product.<br><br>For external use only<br><br>Keep out of reach and sight of children<br><br>Do not use the comb if it is broken or the teeth are missing.